Today, spas are becoming more and more popular. They can be found at fitness centers, resorts, hotels and in healthcare centers. In fact, they are becoming so affordable that many people enjoy them in the privacy of their own homes. The warm water relieves aches, pains, stress and provides for a wonderfully relaxing experience. However, there has been some negativity with regard to the cleanliness of spas and the spread of illness. People should not be discouraged from enjoying a spa; a properly maintained spa will not pose any health problems to bathers. Using ozone in spa water treatment is a great step towards achieving clean and healthy water. This article will discuss spa water treatment and how ozone is the key to achieving clean water. Finally, there will be a brief discussion on how ozone generators are installed on a spa. Proper water sanitation involves three important factors: disinfection, oxidation and a residual. Disinfection is the killing of viruses and bacteria on contact. Oxidation is the breakdown or altering of non-living bather wastes such as organic compounds (greases and oils) from sources such as suntan lotions, body oils and nitrogen containing compounds or amines found in perspiration and urine. The residual is the free available disinfectant always present in the water to ensure that disinfection is being carried out at all times. In order to have the best water quality and maximize the bathers’ enjoyment of the spa, all three water sanitation requirements should be met through a combination of water chemicals and/or treatments. Before any treatment or a combination of treatments can be established, one must realize that treating spa water is very different from treating the water of a typical swimming pool. The following factors must be given special consideration when treating spa water: high water temperature and small volume of water. Spa water is typically maintained between 96-104°F. Chemical reactions take place at a much faster rate at these temperatures than in cooler swimming pool water. For approximately every 20° increase in temperature, the rate of these reactions is doubled. Hot water temperature and aeration also cause the water to evaporate quickly. As it does so, the total dissolves solids (TDS), such as any minerals and salts, as well as organics and bather waste that have been dissolved in the water are left behind in the spa. High levels of TDS can decrease the effectiveness of some chemical treatments. High water temperature also causes bathers to sweat. Sweat contains body oils, salts, urea and uric acid. It has been approximated that an average bather can sweat as much as a pint in just 20 minutes and, therefore, approximately 40 percent more bather waste is released into the spa than into a pool. The action of the jets also quickly scrubs off dead skin cells and dirt. Thus a spa has a much heavier organic load in the water than a pool. A good oxidizer is needed to effectively remove such a high content of non-living bather waste. In addition, the higher water temperature and abundance of non-living bather waste can be a perfect breeding ground for bacteria. Bacteria use non-living bather waste as a source of nutrients. Bacteria occasionally of concern in spas include: Pseudo-monas aeruginosa, Mycobacterium avium and Legionella pneumophila, to name a few. P. aeruginosa can infect hair follicles. Symptoms include an itchy, bumpy rash on legs, arms and torso. M. avium and L. pneumophila can infect bathers from the aerosol created by the jets. M. avium causes flu-like symptoms and fatigue, while L. pneumophila is implicated in Legionnaire’s disease. When a proper level of disinfectant is maintained in the water to kill disease-causing bacteria, fungi and molds, the presence of these microorganisms is easily controlled and a spa can be very safe for bathers. Bathers should never become complacent or stop caring for the water, or not be as vigilant about the levels of desinfectant in the water. Another factor to consider in the treatment of spa water is the small volume of water which creates a heavier bather load compared to that of a swimming pool. Swimming pools typically have at least ten times the amount of water per swimmer compared to a spa. The heavier bather load of a spa can quickly deplete the sanitizer levels. Care must be taken to maintain a proper level of sanitizer at all times given this high depletion rate. The appropriate disinfectants for spa water are either chlorine or bromine. These are the only chemicals that have been approved as stand alone disinfectants. These chemicals have the ability to kill viruses and bacteria very quickly. Chlorine and bromine also provide residual protection, making sure that viruses and bacteria are being killed at all times. In fact, residual is legislated and must be chlorine or bromine. The two most suitable chlorine compounds for use in spas are lithium hypochlorite and sodium dichloro-s-triaz-inetrione or Dichlor granules. Sodium hypochlorite and/or calcium hypochlorite can be used; however, they can facilitate the formation of scale, so the spa owners need to be aware of this and be very careful. Chlorine is an excellent disinfectant and provides a sufficient residual in the water. The recommended amount of free chlorine that should always be present in a spa is 3.0-5.0 parts per million (ppm). If chlorine is used in a spa without any other water sanitation system, it has been estimated that 85 percent of chlorine is used up for oxidation, 2.5 percent of chlorine is used for disinfection, 2.5 percent is used for residual and 10 percent of chlorine is destroyed by the hot spa water. Bromine is more commonly used in spas than chlorine. Bromine is more effective over a wider pH range than chlorine and is, in fact, essentially independent of pH. This is an important consideration since the small volume of water in a spa can result in greater fluctuations in pH than typically experienced in a pool. For spa applications, bromine can be used in a tablet form or a two part system consisting of a bromine salt and an oxidizer. Another advantage of using bromine over chlorine is that the spent bromine in the form of the bromide ion (Br–) can be regenerated into its killing form known as hypobromous acid (HOBr). Bromine tablets (BCDMH or 1-bromo-3-chloro-5, 5-dimethylhydantoin) contain both bromine and chlorine. The active disinfectant is hypobromous acid. Once the bromine is spent, the chlorine functions to regenerate the bromide ion into the killing form: hypobromous acid. The two part system uses a bromine salt known as sodium bromide (NaBr). Sodium bromide establishes a bromide ion bank in the water. An oxidizer such as ozone or potassium monopersulfate can then regenerate the bromide ion into hypobromous acid. The recommended amount of bromine that should always be present in a spa is 4.0-6.0 ppm. If bromine is used in a spa without any other water sanitation system, approximately 80 percent of bromine is used up for oxidation, 7.5 percent for disinfection, 2.5 percent for residual and 10 percent of bromine is destroyed by the hot spa water. As outlined above, the high water temperature causes the water to evaporate. As the water evaporates, bather waste and other organics that were dissolved in the water remain in the spa and accumulate. High water temperature also causes more bather waste to be released into the water as the bathers sweat. This waste builds up quickly in the spa’s small volume of water. A good oxidizer is needed to break down the heavy organic load in the water. Leaving these compounds in the spa water will encourage the growth of potentially harmful bacteria. While beneficial as a disinfectant and a residual, using chlorine as an oxidizer is not the best choice. Chlorine is an extremely good disinfectant and can function as an acceptable residual in the water; however, it performs more poorly as an oxidizer. At spa concentrations, chlorine has the tendency to combine with organic compounds. Chlorine will combine with non-living bather waste such as body oils, cosmetics, antiperspirants and lotions that are at high levels in the spa. In this process, new chlorinated organic compounds are formed which cannot be broken down. These chlorinated organic compounds form scum lines, clog filters and result in the formation of soft-scale. Chlorine will also combine with urine and other nitrogen containing compounds from sweat to form new compounds called chloramines. Chloramines are not effective disinfectants, and they cause skin and eye irritation. They also cause a strong and pungent chlorine odor around a spa. Many people mistakenly assume that if this strong odor is present, the spa is safe to enter. In reality, they are smelling chloramines which do not disinfect the water. The presence of chloramines also indicates that chlorine has been depleted and there may not be sufficient residual remaining in the water. As the chloramines and chlorinated organic compounds are formed, more and more chlorine is needed to establish a sufficient free chlorine residual in the water. This is known as superchlorination. If 85 percent of chlorine is used for oxidation only, this would produce a large amount of chlorinated organic compounds and chloramines in the water. Using chlorine to oxidize the non-living bather waste is obviously not the most efficient use of chlorine. Bromine will also combine with organic and nitrogen containing compounds. The difference between chlorine and bromine is that bromamines formed by the reaction of bromine with nitrogen containing compounds are good disinfectants and cause little irritation and odor. However, using bromine to oxidize non-living bather waste is not the most efficient use of bromine (since 80 percent of bromine is used up for oxidation alone). A more efficient water treatment for a spa is to use chlorine or bromine for disinfection and residual, and a separate and more effective oxidizing agent for the breaking down of non-living bather waste. Ozone is the strongest oxidizer commercially available for spa water treatment. Ozone (O3) is a very reactive gas that causes the characteristic odor sometimes noticed during a thunderstorm. Because ozone is a more powerful oxidizer than chlorine and bromine, it reacts with non-living bather waste more quickly. Ozone, however, does not combine with these compounds, as it is strong enough to cause the compounds to break apart instead. The oxidized compounds (‘broken parts’) are more water soluble and some can also gas-off into the surrounding air. This prevents the formation of chlorinated organic compounds. Ozone also reacts with nitrogen containing compounds from sweat and urine. As these compounds are broken apart, they cannot form unpleasant and irritating chloramines in the water. This in turn reduces eye and skin irritations experienced by bathers. The use of ozone also helps to prevent the formation of scum lines, clogging of filters and the formation of soft-scale. Similarly, if ozone and bromine are used together in a spa, the formation of brominated organic compounds that can also form scum lines, clog filters and form soft-scale, are greatly reduced. When used in conjunction with ozone in spa water, chlorine or bromine function as the primary disinfectants and provide the safety residual. Ozone acts as the primary oxidizer, where it is very effective in removing or altering non-living bather waste. Ozone cannot be used as a stand-alone disinfectant since it breaks down too rapidly to provide a lasting residual in the water. Disinfection therefore must be achieved by maintaining a free-available chlorine or bromine residual in the water at all times. Since ozone is very reactive, it must be produced on site using an ozone generator. This means that ozone is continually being introduced into the water. This allows for a continual oxidation and prevents the build up of non-living bather waste in the water. The continual breakdown of non-living bather waste reduces the amount of available nutrients that bacteria require to grow. The reduced formation of chlorinated and brominated organic compounds lowers the cost of running the spa and minimizes water maintenance since specialty chemicals such as shock treatments, scumline cleaners, filter degreasers, clarifiers, etc., are rarely needed. The use of ozone increases the efficiency of chlorine and bromine as their workload is reduced and they are allowed to tackle viruses and bacteria, rather than fulfilling the oxidation role in the water. Since chlorine and bromine are no longer needed for oxidation, the quantities of chlorine and bromine required for proper disinfection and residual can be significantly reduced. Ozone must be produced on site using an ozone generator. 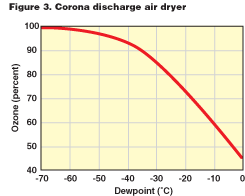 There are two types of ozone generators, ultraviolet (UV) and corona discharge (CD). In ultraviolet ozone generators, ozone is produced by passing ambient air over an ultraviolet lamp. The ultraviolet light from the lamp whose wavelength is 185 nm will split the oxygen molecules (O2) into oxygen atoms (O). The split oxygen atoms combine with other oxygen molecules in the air stream to form ozone (O3). The method does not require any feed-gas air preparation systems. UV systems are well suited for use in spas. They produce sufficient ozone to function as an effective oxidizer in a spa and are much more economical than CD systems because special air preparation and cooling systems are not necessary. In this method, ozone is produced with a high voltage electrical discharge. A controlled spark (corona) splits the oxygen molecules as a prepared feed-gas is passed across an air gap. As the spark splits the oxygen molecules, nitrogen molecules (N2) present in the air steam are also split. The reactions of split nitrogen atoms with moisture in air lead to the production of highly corrosive nitric acid (HNO3). Nitric acid can damage the internal components of the ozone generator, restrict the flow of ozone and even cause premature failure of the ozone generator. Nitric acid production decreases the ozone output of the ozone generator, compromising the quality of the water. Due to problems associated with the production of nitric acid, the feed-gas must be modified or prepared before it reaches the ozone generator. One way of preparing the feed-gas is to remove the moisture from it. Due to complicated and costly air preparation and cooling systems, CD ozone generators are better suited for water treatment applications much larger than spas. If the ozone generator is installed and operated properly, ozone does not pose health hazards to the bathers. Chances of being exposed to any significant concentrations of ozone are very low. Ozone is so reactive that as soon as it gets into the water, it will react quickly with non-living contaminants. By-products of ozone oxidation are harmless oxygen, heat and carbon dioxide. Ozone off-gassing regulations also ensure that the bathers are not exposed to significant concentrations of ozone. How are ozone generators installed on a spa? The installation of an ozone generator onto a spa is relatively simple since most new spas are ozone ready. Two parts are required for the installation, the ozone generator and an injector (also called a venturi). The spa’s equipment compartment contains a section of a ¾” ID flex hose. This hose is spliced into a rigid water line, which leads to the ozone jet located in the spa shell. A section of the flex hose is then snipped out for the installation of the ozone injector. The injector ends slip into the cut-out section of the ¾” flex house. The injector creates suction which pulls ozone from the generator, mixes ozone with water and delivers the ozone to a jet in the spa. After the injector is installed, the ozone output line is connected to the injector suction fitting located on top of the injector. A check valve is installed which prevents the water from backing-up into the ozone generator. The output line is also looped high in the spa cabinet above the water level. This ‘Hartford Loop’ provides extra protection from water backflow. The spa’s control pack should have an ozone receptacle where the generator is simply plugged in. The spa pack will supply the power to the ozone generator and will control its cycle. The ozone generators will only be on when the pump is on. If the spa has a 2-speed pump, the ozone generator will be on when the low-speed pump is in operation. Spas that do not have timers will turn the ozone generator on when the thermostat activates the pump motor. The ozone generator should be run for at least 4-6 hours per day. Spas offer a great way for people to relax and relieve stress. The use of chlorine or bromine with ozone ensures that all three water sanitation requirements (disinfection, oxidation and residual) are met and the challenges associated with the hot water temperature and low water volume are also easily dealt with. Ozone is the best oxidizer commercially available and ozone generators are very easy to install on a spa. With proper water maintenance, including the use of ozone, spa owners can truly enjoy relaxing in a safe and healthy environment.